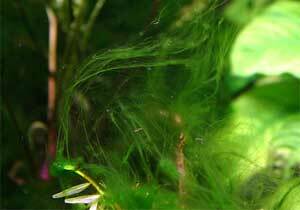 In the aquarium hobby there are generally considered two types of algae - Good and Bad. Good algae is often said to be algae which looks pleasant and provides food for fish and snails. Bad algae is the type that grows out of control, looks unattractive and ruins plants. But these labels are entirely subjective and vary from tank to tank. These are their common names. 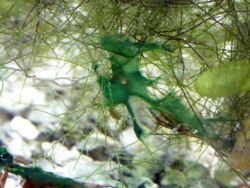 The hobby tends to use these names as quite often a type of algae is easier to identify by its look rather than its species as one type of algae can in fact be more than one of dozens of similar species. Also called BBA or Black Breaded Algae. Appearance: Actually a member of the red algae family, beard algae grows on the edges of plant leaves as well as on the edges of almost any hard surface. Composed of very fine strands it grows in dense patches resembling a dirty green beard, thus earning the name beard algae. Rapid growing, it is soft and slippery, yet clings to plants and cannot be easily removed by hand. It is eaten by only a few fish, notably the Florida Flagfish and the Siamese Algae Eater. Appearance: Actually bacteria (cyanobacteria). Grows very rapidly in blue-green, slimy goo-like sheets. This algae spreads over virtually anything and probably indicates poor water quality. 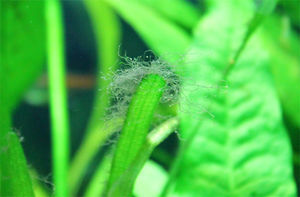 Sometimes seen in areas between the substrate and the aquarium sides indicating that it can survive in aerobic or anaerobic conditions. Will smother and kill plants. It does remove nitrogen from the water and is often seen in aquariums with low nitrates. Believed to consume phosphate amongst other minerals, so you may wish to monitor these levels. It is often removed by performing a total blackout of the tank for a period of time or adding antibiotics. Toxic to aquatic animals if removed by mechanical means. Appearance: brown slimy coating on tank walls, plant leafs. Comes off easily when rubbed. 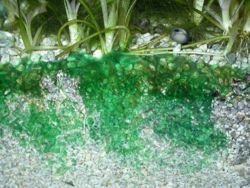 Also known as Diatoms, this harmless algae is frequently the result of New Tank Syndrome and it feeds off the silica given off by the silicon gel used in modern aquariums to seals panes of glass together or high levels of silica in the water. When the cause is New Tank Syndrome the algae will frequently clear on its own as the silicates are used up. 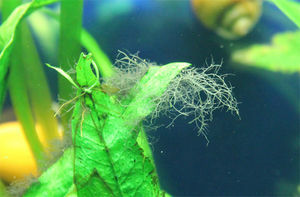 Otocinclus fish and Malaysian Trumpet Snail will eat this type of algae. Hair Algae is dark green in appearance, and can grow up to an inch or more. It is easily removed by hand or by twirling a toothbrush around it. Caridina multidentata will eat this, as well as Florida Flagfish. Can also be removed by sucking up Flourish Excel in a syringe, and squirting it on the affected algae area. It should be noted, that no matter how hard to try, you can never removed algae from the tank. Once it has grown in your tank you can only try to maintain it at quanities that are invisible. Algae when starved of food, will go into a spore state where it lies and waits for the conditions and food supply to improve! 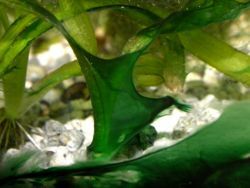 Algae is frequently a sign of a nutrient imbalance within the tank. Every time you feed your aquatic animals some of the food dissolves into the water and into the substrate. This decays into its component parts and becomes food (nutrients) for plants. If you don't have any (or not enough) fast growing plants to absorb these nutrients then algae is always there lying dormant ready to take advantage. Ammonia in low levels is a desirable food for microphytes and macrophytes and algae will act upon this food source quickly and you will get an algae bloom. Every time you add fish food into a tank you are adding Phosphate. This is an essential nutrient for plants and algae. Plants and algae use light as the fuel to build and reproduce. If there are sufficient nutrients in the water or substrate and lots of light but not enough plants, then the algae will grow. As algae is a plant, it is widely recognised that the correct long term way to stop the growth of algae is to starve it. Major nutrients it requires include carbon, nitrogen, phosphorus, and silicon. Other potentially important nutrients include calcium, magnesium, sodium, potassium, and sulfur. Micronutrients required in very small quantities include iron, manganese, copper, zinc, cobalt, and molybdenum. Of all these nutrients, removing any of the major ones will effectively kill the algae. However most of these chemicals are also required by Macrophytes like plants. All plant life requires a light source to produce energy to do photosynthesis. Carbon. This is in the water as DIC. That is as Carbon dioxide and as Carbonates. It is the most essential building block of life. Nitrogen. This is in the water in the form of Nitrates, Nitrites and Ammonia. To remove all Nitrogen from the tank is impossible. But you can reduce the level by ensuring the levels of Ammonia and Nitrites are zero by ensuring the tank is cycled. Nitrates can be reduced by regular water changes or by adding plants to the tank so that they consume the Nitrates. Phosphate. This chemical is usually added to the tank in the form of fish food. 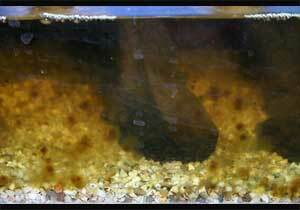 It slowly accumulates in the water and substrate and as its level increases so does the algae in a non-planted tank. By the use of Phosphate removing resins or the regular cleaning of the substrate and regular water changes or by planting lots of fast growing plant to consume the Phosphate you can remove this chemical. Silicon. This is usually in abundance in a new tank as it is in the form of Silicates leaking from the Silicon gel used to seal aquarium joins. Diatoms (Brown algae) is the most common algae which eats this chemical. Fortunately this chemical is in short supply in a tank and the Brown algae soons eats all its supply and starves itself within a few weeks. There are Silicate removing resins on the market, usually sold as part of a Phosphate removing resin property. Light. All plant life requires light in order to process these chemicals and grow. It is often said that reducing the light levels will reduce algae. This is true. But if you also have plants in the tank then you are also reducing the plants ability to remove nutrients from the water with the reduced level of light. If you don't plan on having any plants in your aquarium then life is easy. You simply remove one of the major growth chemicals. More often as not, this is Phosphate or the reduction of light. Plants require Phosphate and Nitrates as well to grow. But if you perform regular water changes, keep the substrate clean and keep the levels of phosphates, nitrates, nitrites and ammonia down then you will keep the growth of algae down to a minimum. Usually this also means a reduced stocking level of fish. 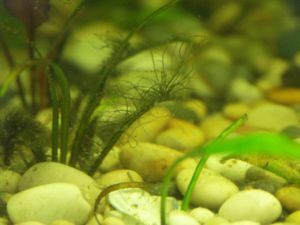 The key to an algae free tank with lots of plants is to ensure that the plants get all the nutrients they need to grow. CO2 being the usual number one limiting factor in an aquarium. Aquarists will often add nitrates and phosphates amongst other nutrients to ensure that the plants keep up a steady growth. This way the plants out compete for the nutrients and so the algae are effectively starved of food. Various methods : EI, PMDD, Walstad method. This list is incomplete. It must be noted that adding animals to eat algae is not a solution to a problem, they will only eat a few of the varieties of algae mentioned above, not all. Big industries use ultrasonics for killing algae in pools and lakes. But there isn't a small commerical unit for sale for aquarium tanks as yet. The major commerical treatment for the reduction of algae is the phosphate removing resin. This usually take the form of a grain like powder which is placed within a reactor or a filter so that water flows through the material and removes the chemical. Once the resin is exhausted you throw the resin away. Algae killing chemicals. This is another popular treatment in the form of liquids on sale and these are very popular with manufacturers. Virtually all trading aquarium companies promote these chemicals and some of them even work. Some have complex treatment cycles. Some are snake oil and do nothing. They only work as long as you keep using them. You stop and the algae returns. They damage any plants you may have in the tank. They could damage the health of your aquatic animals. Some may kill Snails and Shrimps (e.g. eSHA Protalon-707 stuns snails). They don't solve the real reason you've got algae in the first place - excess nutrients. This page was last edited on 6 February 2012, at 23:31.